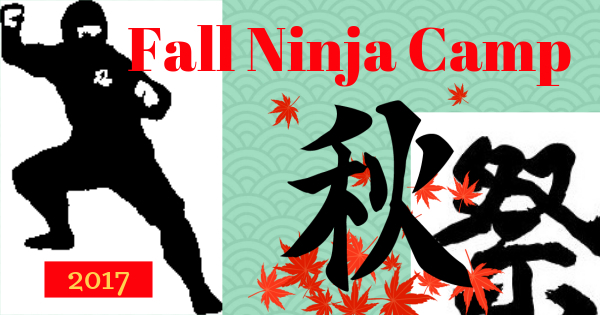 "Fall Ninja Training Camp Intensive 2017"
Making Sure Your Skills Are Street-Ready! Have you ever wanted to just get away from your day-to-day responsibilities and spend several days, doing nothing but ninjutsu training? What would that do for your skill level? How would that change your abilities and understanding of ninjutsu? Because, Fall Ninja Camp 2017 will give you the chance to do just that! ...to live, breath, and train in this powerful and ancient martial art! ...WCI & Shidoshi Miller's Fall Ninja Camp Intensive is the perfect opportunity to spend time with modern-day warriors - high-ranking Martial Arts Teachers who have made studying the ways of Japan's ancient Ninja, their lives! Theme-based Training sessions - Your morning and evening training will be lead by Shidoshi Miller. These training sessions will focus entirely on this year's camp theme. Break-out Training sessions - Each afternoon, we have several black belt and guest Shidoshi teaching a variety of lessons that may or may not be directly related to the camp theme. This is the exciting and, for some, most difficult part of the camp experience. Because here, YOU have to decide what's most important for your own training and progress, and choose the training sessions that will help you move to the next level. Before we layout the training topics for O-Matsuri Fall Ninja Camp 2017, here's a list of some of the reasons why others have made it a point to attend, not just once, but year after year! Sadly Camp has ended. I just wanted to thank everyone that made my first camp one of the best and memorable times in my training so far. I'm still sore from all the fun and 'beatings' we had but would do it all over again in a heart beat. For all of you who didn't come out and have never been to a camp before. WHAT THE CRAP IS WRONG WITH YOU!!!? You are missing out on one of the best ways to improve yourself and your training. It is unlike anything you will ever experience in the dojo. Not only that but you get to train with other like-minded, fun, great people from all over. You have to buy the videos to see what all you missed out on but, I will warn you now, if you think that's all of camp you are sadly mistaken. There are tons of things that are not on the video and you will never get to know why. If you want the full experience you have to come to the camps. Thank you all again for the great time and I hope to see all of you in the fall. Yup, camp was definitely great as usual. If anything, I'd say they keep getting better and better. The attendance continues to surprise me though. In particular, I'm surprised at how few local students attend! It's a great chance to focus on training for long enough to make substantial improvements, get exposed to things you won't be taught in class and to develop deeper, meaningful relationships with your friends and instructors. It's not just that camp is very different from class that makes it valuable, but also that 18 hours of training packed into one weekend is worth a lot more than 18 hours spread over multiple weeks. There's a Canadian and near-Canadian contingent that drives almost 6 hours each way to the camps and we always find that the training, the fun and the friendship are more than worth both the ridiculously low tuition and the 12 hours we spend in the car. I don't understand why there's only a small handful of local students at each camp. You guys are really missing out. You'll never get the kinds of things in class that you'll get at camp. Just an additional note on camp... Which of course was fantastic as always. I spent a lot of time manning the camera for the video of this camp and I can tell you that it will definitely be a valuable training tool both for those that attended and those that did not. However, it contains only about 1/2 of all the material covered in camp. It simply isn't possible to record everything, and it is impossible to record the night exercises! As for local students... I think that they think the material covered in camp will somehow someday be taught to them in regular classes. But the topics are much more far-reaching than can be covered in normal 1hr classes (after all, instructors do have a curriculum to follow to insure students get at least a minimum of what they need to progress). The breakout sessions are taught by a mix of guest and local instructors that share their particular insights and interests on very specific topics and in some cases that material is then tied into other training sessions throughout the camp so you can get a much deeper understanding. As an instructor teaching classes on the floor and as a student taking as many classes as I can... I can honestly say the things that are covered in camp and the way they are introduced and explored can only be experienced by actually going to a camp. Even making it to a 1-2 hour piece of camp will forever change the way you look at your training. During Fall Ninja Camp 2017, you will be exploring the art of Japan's ancient Ninja families with the perspective of "modern application against modern assailants." This is not "soft-training," but a full weekend of intense training where you will learn how to bring the power of this art lo life in your own world. Click on the link below to pay using PayPal, or you may call Warrior Concepts at (570) 884-1118 to reserve your place with a Visa or Mastercard. I want to let it be known, that if a great training experience is what you are looking for then camp is what you want. I went to my first Fall Camp for a half day and never again will I miss out on the whole experience. If the whole weekend is no good than definitely get at least one day. You will not regret it. I made it to Spring Camp, fellow students, and am I ever glad I did. The information and training given out at camp was great and even overwhelming at times. There was more information and training available than time. Ask the instructors, even they were trying to adjust their schedule to get training from guest instructors. The Canadian Instructors were great and very willing to share their information and guidance. The magician was very much sought out for his instruction and overview on misdirection. Mr. Miller gave us some, I would say some awesome instruction on Shindenfudo-ryu techniques. The stealth exercise was something to definitely experience. Some training that just cannot be learned inside, it must be experienced outdoors with nature all around you. We were fortunate enough to attend our first Fall Camp the first year we were in training. The boys have never missed a camp since, either Spring or Fall, and I have been able to attend at least parts of these awesome camps. You simply cannot imagine the scope or the depth of training and information you get at camp. Plus the camaraderie of your fellow students and the opportunity of getting to know all the instructors (home school and guest instructors) is almost beyond description. There is no such thing as "too old", "too fat", "too anything" to attend one of these camps. It is an amazing experience and it takes about 3 weeks to figure out everything you learn!!! Are you one of the literally thousands of people who have been thinking - no - dreaming about what it would be like to master of ninjutsu? To have the skills, confidence, power, and control to be able to help those who cannot help themselves? Have you promised yourself that someday you're going to do what it takes to at-least see what it's like to study and train to be what, even some of the most accomplished martial artists in the world consider to be, the greatest warriors ever created? Or, are you a martial arts practitioner who loves the art you study but, in your heart-of-hearts, would love to do some of the training and intense practice that the Ninja are known for? If you have always wanted to spend some time training with real Ninjutsu teachers who can show you a part of the martial arts world that is still, even after decades of publicity here in the West, virtually unknown to most people, then this Camp is definitely something you want to consider doing. ...is a person of action. ...MUST take action if you are to finally get the chance to see one of your goals - your dreams - become a reality. WCI Ninja Training Camps are awesome opportunities to eat, sleep, and breath the Ninja lifestyle for a few intense days out of your life. And, for some, the experience and intensity of Ninja Camp will live within them for months and years to come. For others, Ninja Camp is the beginning of a new phase in their lives where they actually take their place among the names and faces of our ancient tradition and begin training as official students of Shidoshi Miller or one of the other Master Instructors! If you're ready to make the commitment to be a part of Ninja History - to meet the challenge and adventure of Shinobi no Aki O-Matsuri, Fall Ninja Camp 2011, then you know what your next step must be. Shinobi no Aki O-Matsuri 2011! October 14th - 16th, 2011 in Sunbury, Pa! Only 30 26 Spaces remaining! reserve your place with a Visa or Mastercard. Or call: +1-570-884-1118, to Register by phone.